After almost four and a half thousand kilometers on the cheap hardtail bike I bought back in 2014, I have treated myself to a much better bike – an Orange Four Pro. In my post about trying one out earlier in the year, that I said the Orange Four was my dream bike, but I couldn’t afford one. In the three months since posting that I applied some man maths, working on the basis that it was worth paying a bit more for a bike hand built in the UK. In the end I found a really good deal from Sunset Cycles, the only downside is that I was restricted on colour, so ended up with my third choice colour. A fresh factory order would have been built just for me, but cost significantly more and would have taken a month or two to arrive. Even I am not fussy enough to have gone for that option! It is a similar situation to when I bought my MR2, the best deal had metalic grey paint, so I just went with it, despite it not being my first choice. At least with an Orange bike it is easy to send it back to the factory for a repaint. The Four is the baby of the Orange full suspension range, but perfect for the type of riding I do – more cross country exploring with the odd trail centre visit, than extreme gravity riding. It is a big jump up from my old bike, which I will be keeping for riding around with Owen on the back, or running errands into town etc. The upgrade is of a similar magnitude to when I went from my Rover Metro to my first MX-5. Although in that case the Metro went to the scrap yard. Since ordering, I have discovered that there is a whole commintiy of Orange fans out there, on Facebook and on the trails. I’ve even had other Orange riders chatting to me about it! A massive box got delivered on Friday, whilst I was at home looking after Owen. I was like a kid before Christmas waiting to open it and get the bike built, however I had to wait until Owen was in bed. By the time I got the bike built I only had enough light left for a very short shakedown round the block, which was enough to tell me that there was an awesome bike a few small set up changes away. 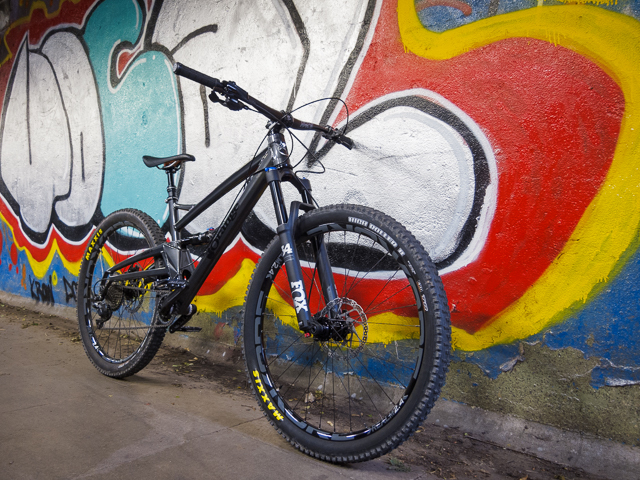 On Saturday, after fiddling with the suspension settings, I managed a blast round my urban woodland loop. These are trails that I know well, including a short test loop I use in Plants Hill Wood, which packs a lot of varied terrain into 500 metres. A rooty downhill section, which smooths out to a twisty flat section then a short technical climb back to the start – perfect for comparing different suspesion settings. After the ride I did some fine tuning to the suspension and cockpit setup, but I was pleased overall. I even stopped to take some photos, including the one at the top of this post. The only problem I encountered on the ride, was that handlebars are wider than on my old bike and don’t fit through some of the anti-motorbike gates on the trails. I do have the option to cut them down, but I want to ride with them as they are for the time being, as cutting them is permanent. The shakedown and local test ride were needed as I was taking the Four to Cannock Chase on Sunday morning, the trails there are much more challenging than the urban woodland loop. I did a lap and a bit of the Follow the Dog trail, I didn’t have enough time for a lap of the Monkey trail as my cute alarm clock (Owen) decided to have a Sunday lie in, so I slept in too. I was a bit reluctant through the first section, “twist and shout”, as it twists between trees and I was concious of the wider bars – it is only 2cm extra on each side, but some of the gaps are pretty tight! I was feeling much more confident when I got to “cardiac hill” – my nemesis. The Four has lower gearing than my old bike and I was able to make it all the way to the top, without stopping and even overtaking someone on the way up. I felt broken at the top, but I still consider it a victory and had some celebratory jelly babies. What goes up must come down – and the Four was brilliant on the next downhill section, much more composed than my old bike, the dropper post meant I could throw my weight around to control the bike better too. I now fully realise why dropper posts are widely claimed to be the best invention in mountain biking. The next section had been remodelled since last time I rode it, cutting out a fireroad climb, which I consider to be a result. The next section, over toward the campsite was perfect for the Four, gently undulating terrain with rock gardens and the odd raised wooden section, I enjoyed it so much I looped back to ride it again! The last section from the campsite back to the car park was where I demo’d the Hope Four earlier in the year. My Four felt just as good as I remembered the uber high spec one I’d tested, which I am pleased about. With a few more small suspension tweaks, tidier routing of the cables and some thicker grips it will be perfect! This entry was posted in Mountain biking and tagged Orange Four, Photo by Lewis. Bookmark the permalink.